Manchester - Manchester City manager Pep Guardiola invited Sergio Aguero to take the squad out for dinner after the Argentinian striker equalled the club's all-time scoring record. Aguero, 29, broke the deadlock in Saturday's 3-0 home win over Burnley with a 30th-minute penalty, taking him level with inter-war player Eric Brook on 177 City goals. "Aguero should pay a tribute to us. He should invite us to dinner maybe," Guardiola joked. "One more goal, it's going to happen sooner or later." Aguero tweeted: "Glad about our win and for my 177. And we're going for more!! C'mon, City!!" Burnley contested the decision to award City a penalty, awarded for a challenge on Bernardo Silva by visiting goalkeeper Nick Pope, but Guardiola felt it was the right call. "It was a penalty," he said. "Bernardo touched the goalkeeper. He touched Bernardo's foot and put him down." Aguero was making his first start since breaking a rib in a car crash in Amsterdam three weeks ago. He joined City from Atletico Madrid in 2011 and has contributed to two Premier League title triumphs and two League Cup successes during his time at the Etihad Stadium. With second-place United crashing to a shock 2-1 defeat at promoted Huddersfield Town, City are now five points clear at the top of the Premier League. They also equalled a club record of 11 successive wins in all competitions. 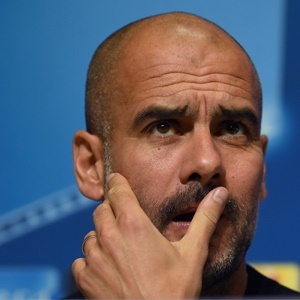 "The record is good if you lift something, titles or a trophy," Guardiola said. "It means a lot. Of course it is not easy to win 11 in a row, so it's good." Feliz por el triunfo y por el ? ?177 ??. Y vamos por más! !/Glad about our win and for my ?177 ?. And we're going for more!! C'mon, City! !